The integration of balers in different recycling treatment processes facilitates the marketing of their products. We offer two types of balers: single or dual ram balers. Single ram balers are used mainly for fibre and/or when only one type of material is baled. A ram pushes the material onto the preceding bale which is held by the friction of the side walls thanks to pressure exerted by cylinders. The bale will be more compact depending on how closed the side walls are, and less compact depending on how open they are. The bale ties holding them together are fastened manually or automatically. 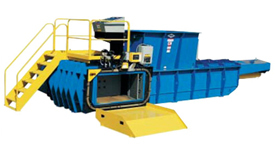 Dual ram balers are recommended when several types of recycled materials are baled together. Their design differs from single ram balers due mainly to the fact that the bales are pushed against a fixed side wall and are then ejected thanks to a second ejection cylinder. This makes it possible to completely isolate two different types of materials to be baled consecutively. Important factors to consider when selecting a baler for any given application are, among others, the bale size (for export or local markets), bale weight (to maximize weight for transportation), cycle time (for the capacity to treat the desired volume of materials) and the type of design (single or dual ram). Once these parameters are selected, the right type of baler can be integrated within your system. Different options can be added, such as desired voltage, the hydraulic unit and control panel's position, remote control switch, bale out-feed table, etc.